Becoming Texan: Moisture: Need. More. Moisture. What's the best smell in the world when you are a farmer in a drought-prone area? Rain. I have always appreciated rain. I can always remember my dad saying, "You never wish away rain," and that's something I have struggled to adhere to. When I was in Michigan, it was so easy to complain about rain. Even the farmers I worked with were mentioning how they wished it'd stop raining. They don't usually have to worry about a lack of moisture for their crops. 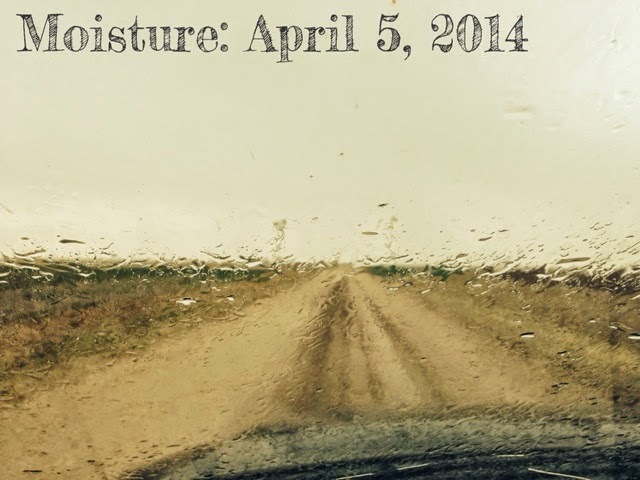 Here in the Texas Panhandle, however, I've grown to appreciate every drop of moisture. It can be a rarity, and this year is shaping up to be another year of drought. We are worried about our wheat not making a harvestable crop because it hasn't gotten enough moisture. We've been pre-watering our irrigated ground that will be planted to cotton and corn because there is no residual moisture to allow the seeds to germinate. Moisture means boom or bust in the agricultural industry, and it could be a bust this year if we don't start seeing some rain (or snow). Maybe that's why I was a bit perturbed by my Facebook newsfeed this morning. I woke up to snow on the ground this morning. 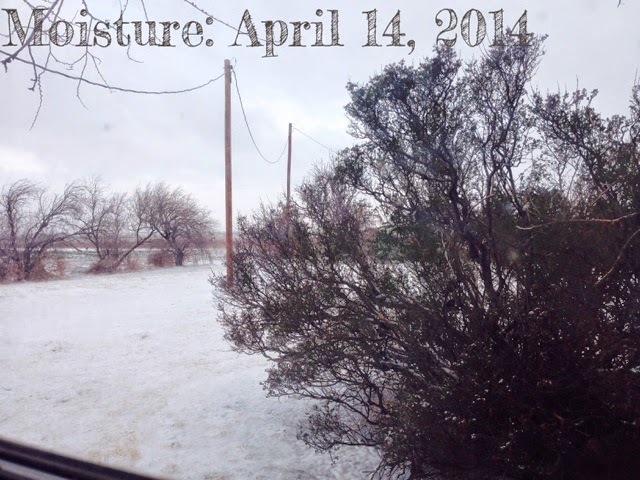 Yep, that's right: April 14 in Texas with a full blanket of snow. Being the warm weather lover I am, I wasn't real excited about the prospect of this snow, but then I thought about the wonderful moisture it is providing us. This snow will melt today, slowly releasing about an inch of water to the ground. This wasn't a pounding rain that will run off. This snow will do us a lot of good. No, it isn't enough by any means, but it will help us. I realized this then proceeded to check my Facebook newsfeed and saw people complaining about this snow. I get it. It totally throws off your wardrobe choices for the day. You won't be able to rock those new shorts you bought on Saturday. But think about this. The cotton your new shorts are made out of will love having some water to use when it gets planted in two weeks. It is easy to forget about how the weather effects those of us in agriculture and how it could effect the end consumer. We are blessed here in the United States. We have an abundance of food, and it is affordable. When anything is so accessible, we often take it for granted. Just like I did with rain in Michigan. The next time you want to complain about the rain or snow, please just think about your food and those of us out here trying to grow it. Then "never wish away rain." Yup, heard your dad say that a lot over the years! Hopefully, ya'll will get some more as you need it.